Can You Pull Off Red Hair? Red hair is having a moment. From Jessica Chastain‘s bright copper to Amy Adams‘ strawberry blonde, the color made some show-stopping appearances on the red carpet this season. Thinking of going red yourself? Before you schedule your color job, consider whether you have what it takes to pull off the look. I spoke with Rick Wellman, co-owner of Patrick Melville Salon in New York City (who recently gave my locks a much needed copper touchup) about what you need to consider before committing to your own red hair makeover. Do You Know Your Tone? 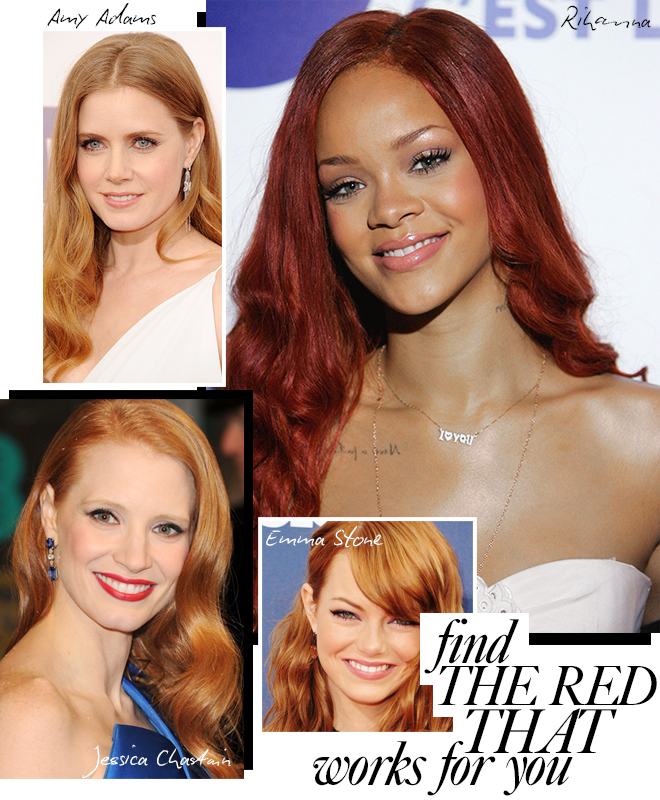 Unlike platinum blonde hair, which only looks good on certain people, red can work for anyone. The trick is to finding the right red for your skin tone. “Freckles, pale skin and light eyes work best with strawberry blonde and copper reds. Darker eyes with cooler skin tones work best with deeper true reds and violet tones,” Rick explains. Emma Stone, a natural blonde, pulls off copper effortlessly while Rihanna’s complexion is compatible with a true red. Reds fade faster than other shades, so expect to visit the salon more frequently. To extend the life of your red, apply at-home glazes, like Pureology Reviving Red Copper Reflect Enhancer ($40, pureology.com), to refresh the color. This weekly treatment seals pigments into the hair through its mix of jaljala and jojoba oils. Rick suggests also using a professional sulfate-free shampoo such as Schwarzkopf BC Hairtherapy Color Save ($18, schwarzkopf-professionalusa.com) which has micro proteins to protect the hair from UV rays and color fading. Are You Willing To Change Your Makeup Routine? New hair color, new makeup choices. Because red hair is so vibrant, you want to choose makeup colors that don’t compete with it. Since I went red, I’ve relied on subtle greens and purples for pops of color. However, don’t steer away from red lipstick. Jessica Chastain is a perfect example of a redhead who wears a red lip successfully. A dead giveaway to a dye job are mismatched eyebrows. “You can tie in a more natural look by carefully brushing on the hair color formula for five minutes only on the brows,” Rick suggests. Fill in sparse sections with a brow pencil, like MAC Veluxe Brow Liner in Redhead ($19.50, maccosmetics.com).